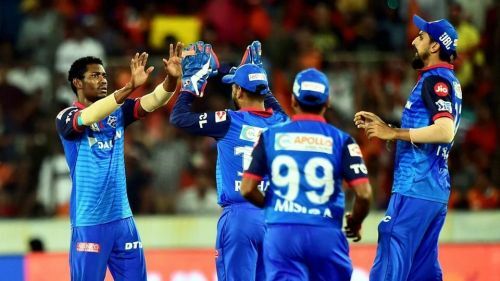 Thanks to Kagiso Rabada, Keemo Paul and Chris Morris, Delhi Capitals registered an emphatic 39-run win over Sunrisers Hyderabad in the 30th match of VIVO IPL 2019 played at Rajiv Gandhi International Stadium, Hyderabad on Sunday. Sunrisers Hyderabad captain Kane Williamson won the toss and decided to field first. Khaleel Ahmed playing his first match of IPL 2019 dismissed Prithvi Shaw and Shikhar Dhawan. Playing his first match of IPL 2019, Colin Munro played with positive intent. At the end of the first six overs, Delhi Capitals were 51 for 2. Abhishek Sharma got the breakthrough by dismissing the dangerous Colin Munro for 40 off 24 balls. Munro and Shreyas Iyer added 49 runs for the 3rd wicket. Shreyas Iyer and Pant created pressure on Sunrisers Hyderabad bowlers with some great strokeplay. Bhuvneshwar Kumar got the breakthrough by dismissing Iyer for 45. Khaleel Ahmed then dismissed Pant for 23 off 19 balls. Sunrisers Hyderabad restricted Delhi Capitals to a modest total of 155 for 7 in 20 overs. Chasing the target of 152 runs to win, Jonny Bairstow gave a flying start to the team while David Warner gave him support. At the end of six overs, SRH were 40 for 0. After the power play overs, both openers played with positive intent. Keemo Paul got the breakthrough by dismissing Jonny Bairstow for 41. Bairstow and Warner added 72 runs for the opening wicket. Williamson failed to contribute as he was dismissed by Keemo Paul for just three. Delhi Capitals restricted the run flow putting pressure on Sunrisers Hyderabad batsmen. Warner reached his half-century off 46 balls. From 101 for 2, Delhi Capitals bowled out SRH for 116 runs. Kagiso Rabada took four wickets while Chris Morris picked three. Brief scores: Delhi Capitals 155 for 7 in 20 overs (Shreyas Iyer 45, Colin Munro 40, Khaleel Ahmed 3/30, Bhuvneshwar Kumar 2/33) beat SRH 116 in 18.5 overs (Warner 51, Bairstow 41, Kagiso Rabada 4/22, Chris Morris 3/22, Keemo Paul 3/17) by 39 runs.